1. Organizing into or administering as a syndicate. 2. Selling an article or cartoon; for example, for publication in many magazines or newspapers at the same time: "She received a good income from the syndication of her articles and illustrations." 1. A figure of speech in which one term is used to represent the whole group of something: Examples of synecdoches include "hand" for "sailor"; the whole for a part as the "law" for "police officer" or "all hands on deck" is an example in which "hands" is used to mean "sailors" and "deck" means "ship". A specific term for some form of generality; as, "cutthroat" for an "assassin" or "head" for "cattle"; or a term for the specific elements, as "thief" for "pickpocket"; or the material for something that is made from it; such as, "steel" referring to a "sword". 2. Etymology: from "part for whole" or "vice versa," from Middle Latin synodoche, from Late Latin synecdoche, which came from Greek synekdokhe; literally, "a receiving together" or "jointly" from synekdekhesthai, "supply a thought or word, take with something else"; from syn- "with" + ek, "out" + dekhesthai, "to receive". © ALL rights are reserved. 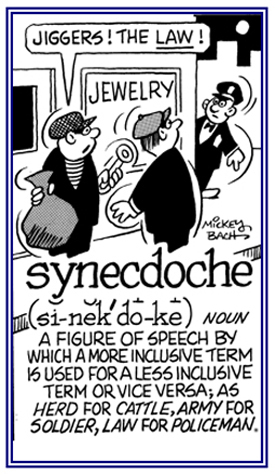 A reference to the meanings of words or text that are not literal; so, using figures of speech; figurative, nonliteral: Manuel used a synecdochic term when he spoke to a young boy in town, "Hey man, can you tell me where I can find the train station?" Relating to a figure of speech or a species of a metaphor, in which a part of a person or thing is used to designate the whole: The home owner made a synecdochical statement when he said, "Our house was built by "ten hands" instead of "Our house was built by five carpenters". Mildred's husband asked his wife a synecdochical question: "Well, little lady, what did the court (judge) decide about your speeding ticket?" A descriptive term for a figure of speech that uses a part for the whole or the whole for a part; or the general for the special or the special for the general: Synecdochically written examples of the "part for the whole": several "head" (of cattle), lunch at five dollars a "head"; "whole for the part"
Germany won 10 gold medals at the games; general for the special: a nasty "beast" (man); special for the general: Jim talks as if he is an "Einstein" (a genius). It is said that when Robert Frost, the poet, called himself a synecdochist, he meant that in himself as an individual was figured the common experience of the human race and vice versa. A reference to the branch of synecology or associated populations in the environment. 1. The structure, development, and distribution of communities in relation to their environments: Henry has been specializing in synecology at the university because he is convinced that understanding plant and animal communities and their relationships with each other is essential for the proper survival of the ecological systems. 3. A study of the interrelationships among communities of organisms, populations, communities, and systems: The professor told his students that synecology includes the science of all living and relevant nonliving components of natural communities and their relationships with each other.